In a truly mystifying turn of events, Rimas has cheated death once again. 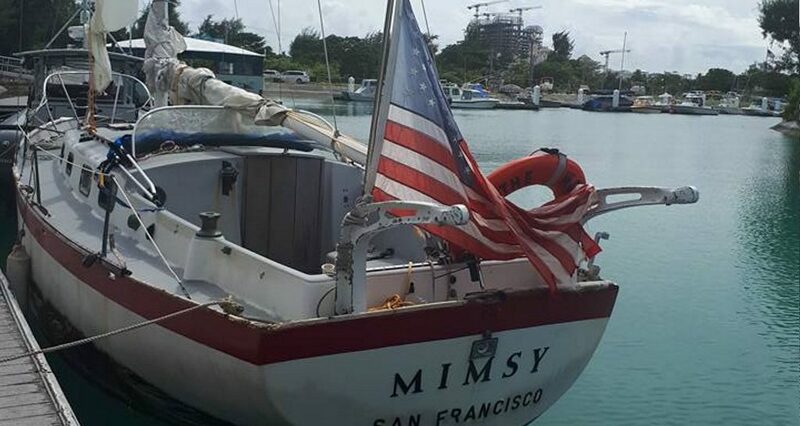 I have been in contact with Saipan Port Police, the Guam Coastguard and also the Saipan 24 hour TV News station and all the messages I have received “suggest” that it is indeed Rimas onboard “MIMSY” that has been towed into Saipan with a broken mast. More news to follow. Before long, Sherri Riggs, a news reporter with KSPN2 in Saipan, Northern Mariana Islands, posted photos of Mimsy on Facebook, notably with a standing mast. She also posted a video of Rimas, looking surprisingly healthy and well-groomed for someone who just spent four-and-a-half months at sea without adequate provisions (or even shade). He described receiving food, water, and batteries from a South Korean ship, which partially explains how he was able to survive. He was also prompted to talk about how once he got within radio range of Saipan, he refused a helicopter rescue so that he could be towed in by the marine police. This proved that beggars can be choosers: Rimas was able to select a specific form of rescue while still keeping intact his unsullied record of never entering a port under his own command. He was at sea for approximately 137 days in total, initially tracking himself from Hawaii to Fiji via his DeLorme, and then without any contact for the last 78 days or so. Between Fiji and Saipan, he traveled about 2800 nautical miles, giving him an average speed around 1.5kts. 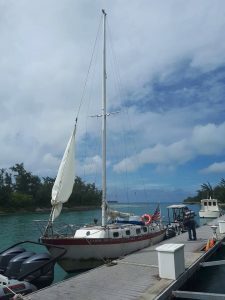 He claims that he sought out Saipan on purpose, which makes sense since he has traditionally preferred American territories and their search and rescue capabilities, although he also claimed that his tiller was broken in Fiji and had no control of the boat, so, as always with Rimas, the details are open to speculation. The word “mimsy” was invented by Lewis Carroll for the nonsense poem “Jabberwocky,” which appears in Through the Looking-Glass. The character Humpty Dumpty defines mimsy as a portmanteau of “flimsy and miserable.” Not a name I would chose for my own boat, although everything is through the looking glass for Rimas. On a purely human level, I’m glad that he survived. For the sake of his eventual rescuers, I hope that no one funds another voyage. At 0245 Oct 17th I was woken up by my cell phone and notified that there was a vessel in distress 15 miles SE of Saipan, no motor, no mainsail, tiller damaged and no updated transmissions. “Mimsy” a 30 ft sail boat was in trouble. My crew and I launched at 0400 in rain, 20 winds, and 500-800 ceilings to make a 105 mile transit to the location. We found Mimsy at 0500, the Zodiac launched from Saipan had to turn around due to sea state and visibility. So I had to decide if I was going to put my swimmer in the water with 10ft plus seas in the middle of the night. A mayday call was made…which by its definition is an emergency. Unable to talk to the vessel, his maritime radio batteries had died, I made the choice to put my swimmer down the line. The first time, he was able to get to the stern, but Rimas had the jib up and my swimmer couldn’t stay with the vessel that was bobbing dangerously. I recovered the swimmer and waited for day to break. I re-inserted my swimmer, who was able to grab a hold of the freeboard railing and jerk himself up. He advised Rimas that he would be able to hoist him to safety…in between Rimas notifying my swimmer of his Facebook followers and Instagram handle, he said he couldn’t leave his boat. Low on fuel I directed my swimmer to re-enter the water for recovery after telling him to pass to Rimas the heading for channel between Saipan and Tinian. We recovered the swimmer, refueled, and then relocated the Mimsy prior to returning to base in order to pass a final lat/long…and heading…which by the way was 90 degrees off of the course required for him to reach the port. Saipan rescue was able to get a boat out to him and tow him in…again. I don’t normally like to write about the stuff I do at work and I promise you this isn’t grand standing…it’s a guy that is pissed off that I had to put my crew and especially my swimmer in harms way for this guy. His “adventure” is going to eventually cost a life, and while most likely it will be his God forbid it’s somebody trying to help him when he cries wolf and is just looking for a free ride to port. Thanks for taking the time to comment, Matt. This has been my concern all along…his incompetence and unpreparedness putting others in danger. Thank you for your service, even if this fool doesn’t deserve it. well said matt , he endangers the life of all rescuer’s , because he wont learn how to sail his boat . thanks for your service, and maybe turn the radios down if you know he’s in the area ! Thank you Matt for contributing your perspective to this thread and thank you for your dilligence to keep the oceans safe. I hate Gov. Regs. but this guy should be forbidden from sailing again. It shouldn’t even take a regulation. All it would take would be for people to stop buying him boats and supplies and towing him off the dock.